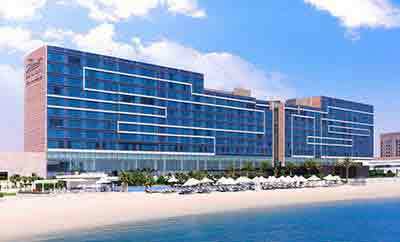 Fairmont Bab Al Bahr boasts a prime location at the mainland gateway to the cosmopolitan city of Abu Dhabi. 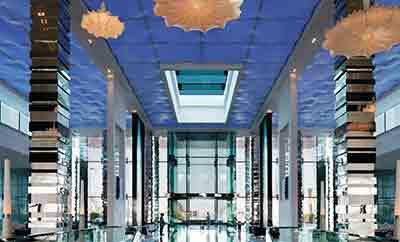 The hotel showcases unrivalled views of the Sheikh Zayed Grand Mosque and provides easy access to the city centre and main exhibitions facilities. It is also in close proximity to city's numerous golf courses. Abu Dhabi International Airport is about 25 kilometers from the hotel. 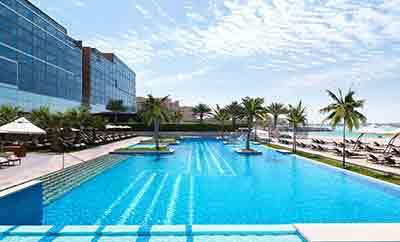 Fairmont Bab Al Bahr, a beachfront business hotel offers the highest level of comfort and elegance throughout its 369 guestrooms and suites, including the ultimate exclusive lifestyle hotel experience with Fairmont Gold. The hotel boasts many opportunities for on-site activities for leisure, including access to a private beach and two swimming pools. A variety of flavour experiences awaits you at any one of Fairmont's eight restaurants and bars. Cedar Lounge Lebanese Restaurant & Bar: Serves cuisine authentic to the region from mezze to kebabs to tapas style dishes while offering both indoor and alfresco dining options. 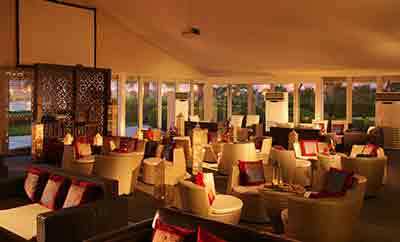 Al Naba's a Lounge: Here guests may enjoy one of many selections of blends available and a full range of delectable offerings. Chameleon: Featuring an impressive range of signature cocktails, vintage Champagnes combined with savvy mixologists and innovative cuisine. Elements: This casual, yet elegant venue serving an abundance of international buffet offerings from Europe, Asia and the Middle East. Frankies Italian Restaurant & Bar: Guests can enjoy authentic Italian cuisine in a bustling indoor venue or at the outdoor courtyard. Drawing on the popularity of its sister restaurant in Dubai. Marco Pierre White Steakhouse & Grill: Guests will experience an eclectic combination of innovative grill cuisine and classic English fare, accompanied by an extensive wine selection. Poolside: Enjoy a cutting edge menu featuring gourmet burgers and blended beverages and cocktails, while admiring spectacular views of the Creek. The Chocolate Gallery: Here you can enjoy a full range of signature hot and iced chocolate beverages are complimented by mouth-watering fondues, cakes, truffles and pralines. These guest rooms combine contemporary decor with everyday functionality. Fairmont View rooms offer commanding views of the Abu Dhabi Creek and the Sheikh Zayed Grand Mosque. Offering a spacious living area highlighted by contemporary decor. Deluxe Creek View rooms offer commanding views of the Abu Dhabi Creek and the Sheikh Zayed Grand Mosque. Embracing an organic theme throughout, the Presidential Suite employs modern decor with the use of rich textures, marble and wood panelling and bamboo inspired furnishing. The Royal Suite is superior in size and luxury and features two custom designed bedrooms, two well appointed bathrooms, a private dining area and a spacious living area. Fairmont Gold Rooms combine contemporary decor with everyday functionality & highlighted by walnut wood panelling. Guest will also enjoy a full range of Fairmont Gold services and amenities, including access to an exclusive Fairmont Gold lounge and a private check-in/check-out area. Fairmont Gold View Rooms combine contemporary decor with everyday functionality & highlighted by walnut wood panelling. 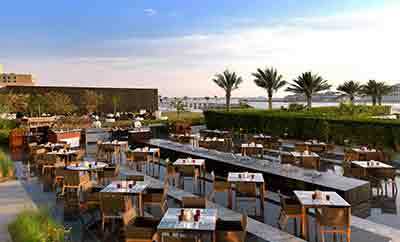 Offers commanding views of the Abu Dhabi Creek and the Sheikh Zayed Grand Mosque. Fairmont Gold Suites are elegantly appointed one bedroom suites with a separate living space. Fairmont Gold View Suites are elegantly appointed one bedroom suites with a separate living space. Fairmont Gold Premium Suites are elegantly appointed one bedroom suites with a separate living space. 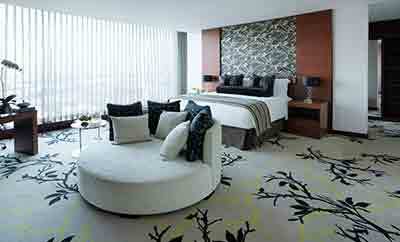 Fairmont Gold Signature Suites are elegantly appointed one bedroom suites with a separate living area. Accessible by private elevator, the Fairmont Gold Vista Suite features a spacious living space, a well appointed bathroom and a guest bathroom. Guests can also enjoy exclusive Fairmont Gold lounge access, private check-in/check-out, on-call butler service and bespoke VIP amenities.